We’ve already seen what Intel’s new Kaby Lake platform looks like in its top-end Core i7 7700K trim, and what MSI can do in the Z270 mid-range, but what do you get if you pay a little bit more for your 200-series motherboard? Gaming performance isn’t just visual, you need quality audio too. Our pick of the best gaming headsets will deliver just that. 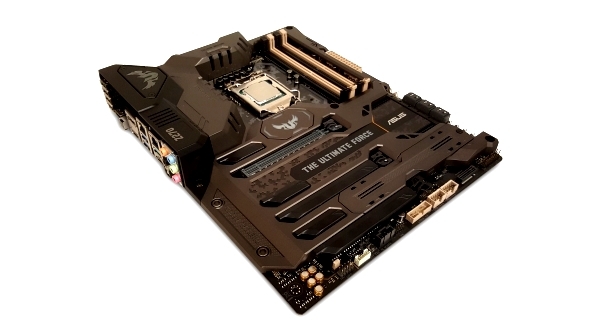 At last count Asus were launching some 27 different board configurations, with this TUF Z270 Mark 1 coming around the higher-end of their motherboard stack. At the very top are the Republic of Gamers (ROG) boards with the STRIX and Prime ranges taking care of the middle and lower order of Asus Z270 mobos respectively. 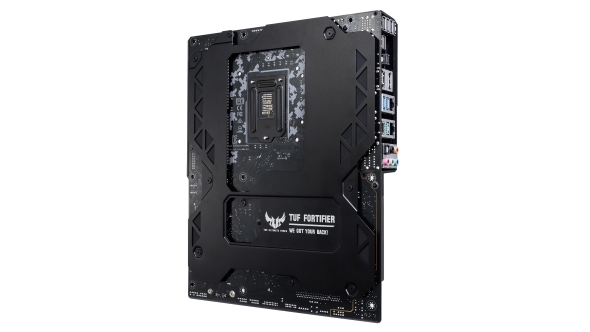 The TUF Z270 Mark 1 has ditched the old Sabertooth name and sits between the lower order ROG boards and above the STRIX range, with a retail price of somewhere around $255 (£225). Click the jump links below to make a leap to the section of your chosing. 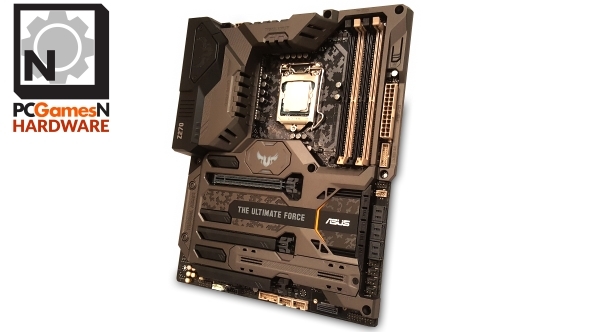 Calling this slab of PCB ‘The Ultimate Force’ might be slightly overselling it as a motherboard, especially when Asus themselves are selling another five boards with specs and prices far in excess of the TUF Z270 Mark 1. The ROG Maximus IX Formula is going to cost over $500 (£550) according to recently leaked pricing documents and I don’t even think that’s Asus’ ‘ultimate’ motherboard – there’s also a Maximus IX Extreme, but we haven’t seen any early pricing for that one. Suffice to say it ain’t going to be cheap. Anyways, the TUF Z270 Mark 1 would be described as upper middle class, if we were in the habit of personifying technology. It’s got a greater feature set than a bog-standard Z270 board, but isn’t covered in the sort of bright red push-buttons and voltage-checking point accoutrements you might get in the upper echelons of overclocking-focused mobos. Despite the price difference though, this Asus is actually mighty close in spec to the MSI Z270 Gaming M5 we’ve also tested. 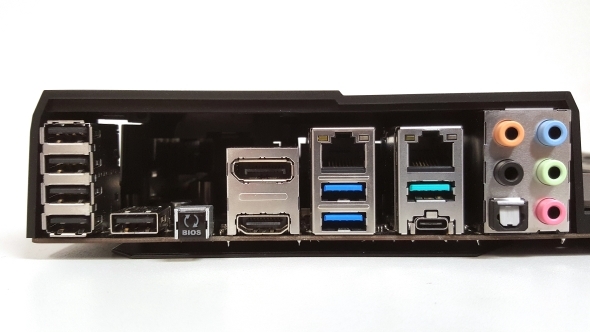 It has almost the same configuration of USB connections on the back panel, in a variety of flavours, the same number of SATA and PCIe slots and the same number of M.2 sockets on board. The Asus board does have its pairing arrayed around the board differently; it’s got one horizontal M.2 port slotted in underneath a plastic hidey-hole (there’s no thermal padding, so it doesn’t work in the same way as MSI’s M.2 Shield) and a vertically-oriented one on the edge by the USB expansion headers. It’s also got similarly reinforced PCIe slots and shielded HD audio components on board too. 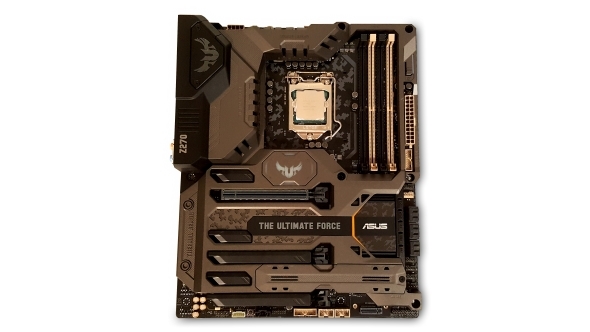 What’s different with the Asus though is the ‘Thermal Armor’ covering the board. I’m not 100% convinced the armour does a whole lot in terms of the thermals, but the overly plastic covering on the top is complemented by the rigid metal frame on the reverse side. This robust ‘TUF Fortifier’ stands proud of the rear of the PCB, giving it some robust underslung scaffolding which means you won’t end up bending your board when forcibly jamming in components. It can be a genuine problem, especially for serial upgraders like myself. Even in the short time I’ve been using the latest boards a few of the other Z270s have started displaying a slight curve. A little bend is unlikely to be a real issue (and adds a pleasing contrast to the relentlessly angular nature of all your other components) but when a board is stressed too far it can disrupt electrical connections leading to all kinds of breaky, no-worky kinds of problems for your PC. Despite its relatively high-end status and price-tag the TUF isn’t the outright quickest of the early Z270 boards I’ve tested. Its Cinebench index scores are marginally behind the rest, even the ~$120 (£120) Prime Z270-P, but the X264 v5 video encoding test is more promising, as is its PCMark score.It’s a similarly mixed bag when it comes to the gaming and GPU benchmarks too. Asus take top spot in the Vulkan-based Doom test, but that’s about it. But in truth though all of the Z270 boards are delivering near identical scores in both CPU and GPU-intensive testing, leading one to believe that maybe the board itself doesn’t have a great deal of impact on general performance levels. In benchmarking terms there’s really very little between the different Z270 options. It’s a slightly different story in our storage tests though, with the two Asus Z270 boards I’ve tested delivering the fastest performance with our Samsung 960 EVO NVMe testing drive. The Asus TUF Z270 Mark 1 also seems to be the most adept at dealing with the thermals of the Kaby Lake processors too. I’m not convinced as to how much of that is down to the Thermal Armor covering the board, rather it’s more likely something in the power componentry that’s keep things clean and cool. None of that has helped the TUF board do anything more impressive than the others when it comes to basic overclocking, however. We still only managed to get a full, stable benchmark run through our initial Core i7 7700K sample at 4.9GHz. Like all the other boards we could boot into Windows at 5GHz, but couldn’t get it to function in a fully stable condition. Intel have made things increasingly awkward for motherboard manufacturers by making the processor almost entirely responsible for general PC performance. Across our test suite there is precious little difference between the Z170 and Z270 chipsets, or the different Z270 boards I’ve tested. That means it pretty much all comes down to price and feature set. And in those terms the latest Asus makes for a quality Z270 board. Price-wise the TUF Z270 might be a little on the expensive side of things, costing an expected $255 (£225), but the flip side of that is you get a board which genuinely embodies the non-marketing spelling of ‘tough’. The rigid back board stops any unnecessary flexing of your mobo and keeps all the points and contacts in the right place. With all that comes Asus’ confidence in their build quality, manifesting itself in the seriously impressive five year warranty bundled with the TUF Z270. There may not be quite as many niche little extras as you get with the MSI Z270 Gaming M5, but it covers all the necessary bases and Asus’ motherboard software is outstanding, probably the best in the business. The Asus BIOS is typically excellent and now comes with some important new features for their Z270 platform. For a start there’s a 5GHz overclocking profile built into the latest firmware, though sadly with our i7 samples it was the same situation – boot, but no fully-stable cigar. The Asus BIOS also comes with a smart new Overclocking Temperature Control – much needed with the toasty new Kaby Lake CPUs. It allows you to set a specific multiplier and voltage setting to drop the CPU down to when your silicon’s getting too hot for comfort. Sure, it’s manual throttling, but when you’re overclocking you do want to have that level of overall control, so kudos to Asus for offering it. I do struggle with the TUF name though. The Ultimate Force. It evokes thoughts of some B-list action movie starring a cast made entirely of WWE ‘superstars’ doing an act at a camera, emoting through the twin mediums of firearms and pectoral muscle twitches. 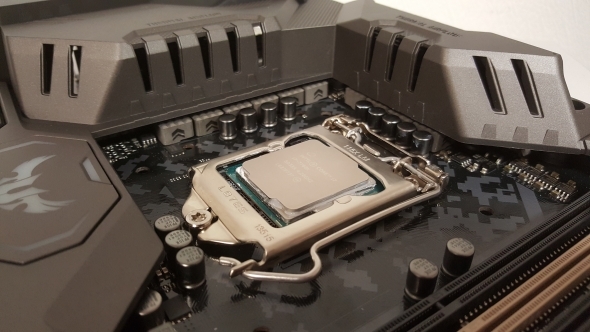 But it’s a ‘gaming’ PC component so of course the TUF Z270 Mark 1 has a silly name, conceived in a bath of testosterone. Minor naming quibbles aside I’m finding it difficult to pick which of the MSI and Asus boards I’d want as the basis for a new Kaby Lake gaming PC. The MSI is impressively-priced and feature-rich, but because of their clean, supremely useful BIOS, lengthy warranty – and because I’m such a ham-fisted PC builder – I’m leaning towards this more expensive, more robust Asus.